Are you willing to commit to a new YOU? 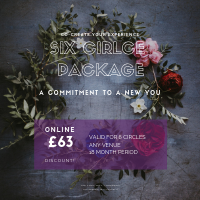 When you choose to buy a six-circle package, you are choosing to co-create a beautiful circle community, sacred space for yourself and others and and in doing so, causing a ripple effect that changes the world. Our impact in Circle is huge and not to be taken lightly. We are here as ONE in circle and I invite you to join me in celebrating you and the other women who journey with you.